***Note: For fruits baskets, local orders only are taken. This wonderful basket can be sent to congratulate someone. It contains apples, grapes, oranges, kiwis, pears, bananas, peaches. This basket is just to say "I am still thinking about you". It contains pineapple, oranges, apples, grapes, bananas, pears. This is to just say "hello". It contains apples, oranges, kiwis, bananas, pears, grapes. This basket is to let someone know you care. It contains apples, pears, grapes, bananas and leaf decor. This basket can be sent to a co-worker. It contains pears, apples, bananas, pineapple, grapes, oranges. This basket can be sent to show appreciation. It contains grapes, oranges, apples, bananas, pears and a leaf decor. 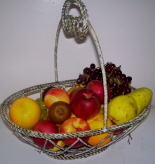 This basket contains apples, grapes, oranges, pears. This is to just say "hello". Say it all through this basket. It contains pineapple, oranges, bananas, pears, apples. Too lovely basket. Say it once. It contains apples, pear, oranges, grapes and a leaf decor. Once again, say it all through this basket. It contains pineapple, oranges, bananas, pears apples. Through this basket, take the opportunity to say it this time. It contains apples, bananas, pears, oranges, grapes, pineapple, and a sunflower to add charm and character to the basket. Fantastic basket! Can't forget about you. 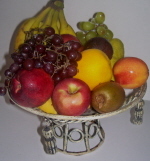 This basket contains apples, bananas, pineapple, grapes, pear, and leaves decor to enhance the mood. Always in my mind basket. This basket contains apples, pineapple, pears, bananas, grapes, oranges, strawberries. Can't stop thinking about you basket. It contains pineapple, bananas, oranges, apples, grapes, pear, and leaves decor for warmth and charm. Charming basket. It has pineapple, bananas, oranges, apples, grapes, and leaves decor. This nature basket can be sent for any occasion. It has bananas, apples, oranges, grapes, and leaves decor to relax the mood. Lovable basket. It contains pineapple, apples, oranges, pear, grapes, and leaves decor for relaxation. All occasions basket. It contains pineapple, grapes, apples, pear, bananas, oranges, strawberries. All occasions basket. It has bananas, grapes, apples, oranges, pear. Special basket for all occasions. It has pineapple, bananas, grapes, apples, oranges, and a leaf decor for the relaxation of the mind. Healthy basket for all occasions. It has pineapple, grapes, bananas, oranges, pears, apples. All occasions basket. It is made of oranges, apples, bananas, grapes, pear. All occasions basket. It is made of pineapple, bananas, apples, oranges, grapes. All occasions basket. It is made of pinapple, bananas, apples, grapes, pear. All occasions basket. It is made of pineapple, bananas, oranges, apples, grapes, pears. All occasions basket. It is made of pineapple, grapes, apples, pears, bananas, oranges, strawberries. Our nature basket. It is made of oranges, pears, pineapple, grapes, bananas, apples, and some leaves decor for charm. All occasions basket. It contains apples, grapes, pineapple, pears, oranges, bananas. Lovable basket. It has pineapple, bananas, pears, grapes, apples, oranges, strawberries, and a sunflower decor to enhance the mood. Item # AMAGB FB 30 $79.99 All occasions basket. It has pineapple, bananas, grapes, oranges, apples. All occasions basket. It is made of pineapple, grapes, bananas, apples, oranges. All occasions basket. It contains pineapple, bananas, oranges, grapes, apples. Greenery Basket. It is made of grapes, bananas, oranges, apples, pears, pineapple. All occasions basket. It is made of bananas, oranges, pears, peaches, kiwis, grapes, apples. Tea Basket. It is made of crakers, apples, apple cider. This Gourmet Basket contains chocolate bars, apple cider, crackers, coffee. This Gourmet Basket contains peanuts, almonds, cookies, apple cider, tea. Falling leaves basket. It has pineapple, oranges, grapes, apples, pears, bananas, and a fall decor for fall mood attraction. Cornucopia basket. It is made of oranges, grapes, apples, pears, bananas. Charming cornucopia. It contains grapes, pears, oranges, apples, bananas. Fallnucopia basket. It is made of grapes, pears, oranges, apples, bananas, pineapple. Thanksgiving basket. It has pineapple, grapes, apples, pears, oranges, bananas, and fall leaves decor for the holiday. This floral basket can be used for all occasions. It is made of pineapple, oranges, bananas, apples, pears, grapes. This beautiful basket brings warmth and character to your fall party. It is made of pineapple, orange, pears, apples, grapes, bananas.